Get the Right Companion for You, How to Find Hybrid Puppies! Designer or hybrid puppies are all the rage right now! And for good reason! Hybrid puppies are bred from two purebred dogs from different breeds, hence the term designer, which implies a bloodline created by mixing purebreds. Purebred puppies are simply puppies that are bred from two dogs of the same breed. If a dog is not purebred, it is considered to be a hybrid or mixed breed (commonly referred to as a mutt). USDA licensed breeders and distributors with no direct violations on their latest inspection report who have a veterinarian-documented socialization and exercise program and follow veterinarian protocol for skin, coat, nail and dental hygiene. Hobby breeders as defined by the Animal Welfare Act (AWA), who raise their dogs in a humane manner. Local adoption pets that are vet-checked. Some of our puppies and kittens come from local animal shelters or from members of the local community as part of Petland’s Adopt-A-Pet program. With over 45 years of experience in responsible pet sourcing, Petland has developed state-of-the-art standards for its retail pet stores. This means you can trust our choices in breeders not only because of our standards, but also because of the USDA’s oversight. The Animal and Plant Health Inspection Service (APHIS), a division of the USDA, is tasked with the important job of inspecting the professional puppy breeding kennels that Petland partners with, under the guidelines of the AWA. Proper identification of all animals. Proper record keeping of veterinarian visits, protocols, health checks and certificates, vaccinations, and de-worming. Documentation of pets purchased or sold with proper age records. Housing (indoor, outdoor, and sheltered) is checked for soundness of construction, impervious nature of materials, ventilations, temperature, adequate size, flooring, walls, and safe surfaces. Compatible grouping of dogs for safety and socialization. All animals must receive adequate exercise, daily feeding and watering, and be housed in a clean and sanitized environment. These controls mean that when you purchase a hybrid puppy from Petland, you can rest assured that from the breeder to our retail stores, we are committed to animal welfare and the quality of our pets. Rottweilers are a perfect companion and a popular choice among Petland shoppers! Obedience is a quality that is highly desired by pet owners. Rottie puppies learn fast and are skilled listeners. They are known for their intelligence and their ability to comprehend and remember commands quickly. This makes training a Rottie puppy a breeze. You will be surprised at how fast your Rottie puppy begins to pick up commands. Loyalty is also a trait of Rottweiler. Once your Rottie begins to form a bond with you, they will be loyal to the end. The relationship between humans and dogs is unique, but with Rottie puppies the connection is enhanced by their loyalty. Be prepared to form a friendship that will fulfill you more than you ever imagined. They have a sense of fearlessness. Rottie pups are not afraid to take a leap of faith. Their sense of fearlessness is why they learn so fast. They will fall and quickly recover from mistakes, with a jovial and playful attitude. Their courage will keep you on edge as they learn by testing boundaries! Rottweilers originated in Germany and were called Rottweil Metzgerhunds, which translates to Butcher Dogs. Their role was to serve as guard dogs for butchers. This is likely the reason Rottie puppies are instinctively disciplined. They have a long lifespan. If you are looking to enjoy close to a decade with your dog, then Rotties are perfect for you. They live an average of 8 -10 years. While this may not seem long, keep in mind that larger dogs typically have a shorter lifespan. It is also important to remember that dogs age more rapidly than humans and the average lifespan for most dogs is 10-13 years. 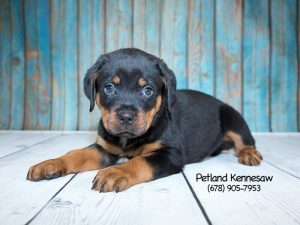 If you love Rottie puppies as much as we do, stop by our local Petland and take home a companion that will provide an abundant amount of joy and add endless value to your life. Check out pictures of the Rottie puppies for sale in our store, right here on our available puppies page! Short hair puppies are great if you want low maintenance grooming. Bathing a short hair dog is an important step to keeping your dog’s hair and skin clean. Opt for sulfate free shampoo and hydrating conditioners made for short hair dogs. We recommend Tropiclean or Nootie Dog brands, which are available at Petland. The drying process is super fast with short hair dogs. You don’t have to use a blow dryer, but rather an absorbent towel and your puppy’s hair will dry naturally. If you live in a cooler climate, wait at least two hours for the coat to completely dry, before letting your short hair dog outside. You can encourage your dog lie near a heated vent to dry faster. Your short hair puppy’s nails may grow past the toe pads. This can become painful and dangerous for your dog. Petland carries dog nail clippers that safely clip without causing pain. Dogs generally don’t enjoy nail trimming, so your puppy may try to flee! Be sure to use rewards and positive reinforcement to encourage cooperation. Short hair dogs generally don’t require much combing or brushing, but this can vary depending on their hair types. Stop into a local Petland and ask our friendly staff for expert advice, if you plan to purchase a brush for your short hair puppy. Short hair dogs have little to no facial hair. Petland carries dog grooming clippers, but if your puppy’s hair is short don’t bother using clippers to tame facial hair. Save yourself time and energy and have a groomer clean up any stray hairs. At home grooming is a breeze for short hair dogs. Use these simple grooming techniques and your dog will look and feel fantastic. At Petland, we believe in sharing the knowledge you need to give your dog the best care possible. Contact us for any of your pet needs! Petland is the retail pet industry leader for animal care. Petland is committed to responsible pet sourcing. USDA licensed breeders and distributors with no direct violations on their latest inspection report. The breeders have a veterinarian documented socialization and exercise program and follow the veterinarian’s protocol for skin, coat, nail, and dental hygiene. Local adoption pets that are vet checked. Some of our puppies and kittens come from local animal shelters or from members of the local community as part of Petland’s Adopt-A- Pet Program. Petland staff can answer your questions. The number one reason why an individual becomes a Petland franchise owner is their love for pets. We celebrate our love for animals and pride ourselves on being pet experts. Our staff members are a great resource if you are looking to increase your knowledge on caring for your dog. We believe in sharing our knowledge with our customers and the community through outreach and community service. Petland offers a wide variety of breeds. If you are in the market for a specific breed, chances are Petland has it. Our network of USDA licensed breeders provides us with a vast selection of puppies that are up-to-date on vaccinations and de-worming and are microchipped. When you buy a dog from Petland you also receive the name and address of the puppy’s breeder and a written health warranty for the puppy. Select Petland locations offer financing. Buying a dog doesn’t have to break the bank. Select locations, including Petland Mall of Georgia in Georgia, offer pet financing. This is an affordable and ethical alternative to pet leasing. The application process is simple and approval decisions are made within minutes, so you can buy the puppy of your dreams today and pay later. You become part of the solution. When you purchase a dog from Petland you join of community of happy pet owners bonded by their love for animals and dedicated to ending animal homelessness. By purchasing a Petland dog, you support a company that donates to rescues and you become educated with the long term needs of your dog. 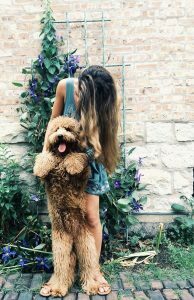 This education and proper pet training decreases the number pet owners who give their dogs to rescues due to bad behavior and solves the problem of overpopulated shelters. 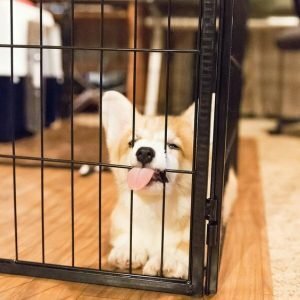 Petland says, “Let’s get back to the basics!” A guide to the dreaded housebreaking and teething! If you recently purchased a puppy from Petland, then you know that our staff is dedicated to providing education to new pet owners. This article is an all-in-one resource from Petland created for new pet parents. Invest in a vacuum with a pet filter to cut down on hair and pet dander. Purchase a cleaning spray with urine odor eliminator for accidents. Purchase potty pads and change them when they are soiled. Use a playpen as a safe, spacious, and controlled play area while you clean. Keep bathroom doors closed to keep toilet paper on the roll. Home destruction can get a little dirty. 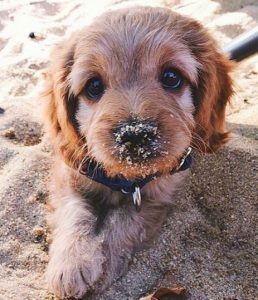 Your puppy will need regular at home bathings, as well as scheduled visits to the groomer, especially if they have long hair. Here are a few things you should know about keeping your puppy clean. Not all shampoos and conditioners are created equally. Consult with the staff at Petland for recommendations on the best shampoo and conditioners for your puppy. Nail clipping is better left to the professionals to prevent injuries. Brushing your puppy can improve bonding. Be patient, gentle, and purchase the proper brush for your puppy’s hair type. Puppies take playtime very seriously! If you are a new puppy parent here are few toys your puppy will love to chew. Braided tug-o-war ropes – These won’t unravel as your puppy proves just how strong his jaws really are. Durable chewy balls – These won’t break apart like tennis balls and end up in the stomach of your puppy. Rubber animals – These make stimulating sounds and won’t break apart like stuffed animals. Expect accidents and don’t punish your puppy. Use positive reinforcement and rewards. Clean thoroughly, as urine odors will tempt your puppy to revisit and re-soil! Similar to humans, puppies can easily become unhealthy if they eat too much of the wrong foods. Choosing the right food not only improves your puppy’s health, but it will also improve your interaction with your puppy. Here are a few pointers for selecting the proper food. Ask for help – At Petland, we understand that dietary needs vary by breed. We can help you select the right food based on the breed of your pup. Create a feeding schedule – By scheduling meals, your puppy will begin to understand the feeding routine and know when to expect a meal. Do not give your puppy human food – No matter how cute your puppy looks when she begs, avoid the temptation of feeding her table scraps. All the nutrients she needs are in her puppy food and furthermore it creates a bad habit of begging and makes your meal time stressful. Puppy parenting is a joyful time of bonding and learning. At Petland, our goal is to educate pet owners and end animal homeless. Learn more about puppy parenting and the tools you need to make the experience easier by stopping by your local Petland today. 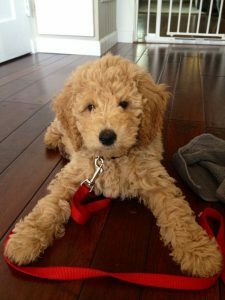 Be an Informed Shopper: How to Find a Purebred Puppy! If you haven’t bought a new puppy in a while, chances are things are different! Get up-to-date with our blog! Purebred puppies are simply puppies that are bred from two dogs of the same breed. This is often proven with registration paperwork from the different companies, like AKC, CKC, ACA, etc. If a dog is not purebred, it is considered to be a hybrid or mixed breed (commonly referred to as a mutt). 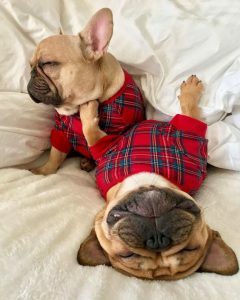 Hybrid puppies are deliberately bred from two purebred dogs that are different breeds, hence the term designer, which implies a bloodline created by mixing purebreds. Mixed breeds are generally bred from two dogs of blended breeds and their bloodlines are usually not as traceable. These controls mean that when you purchase a purebred puppy from Petland, you can rest assured that from the breeder to our retail stores, we are committed to animal welfare and the quality of our pets. Learn more about how to find a purebred puppy by visiting our location, or check them out on our website, right here! Every child dreams of having a pet puppy, but as parents, it’s difficult to know when the time is right to bring a puppy home. With busy schedules and after school activities, adding a puppy to the mix may seem like a bit much. At Petland, we understand that puppies require love and attention, so we want to help your family make this big decision. Here are five ways to tell your children are ready for you to buy a puppy. Your family has discussed the decision together. 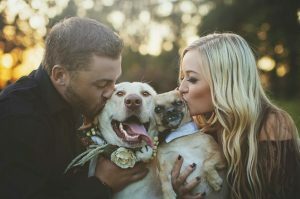 A family pet is a family decision. Everyone needs to be onboard with having a puppy, because the responsibility of taking care of the puppy will be shared. Sit down as a family and allow everyone to share how they feel about having a puppy. Be sure to discuss the responsibilities as well, which includes feeding, walking, cleaning, and most importantly loving the puppy. If your family is planning on buying a puppy, take a Saturday trip to Petland and meet the puppies and friendly staff. Let the kids have time to interact with the in-store puppies, and ask any questions you may have about pet ownership. Your children are communicating an interest in animals. As your children grow, they will begin to understand the world and gain a sense of empathy. When your children begin to express an interest in the well being of animals, they are ready to learn the responsibilities of pet ownership. The routine tasks such as feeding, walking, and bathing a puppy will come in handy later in life. At Petland, we believe that the children of today are the pet owners of tomorrow. Your children’s playmates have pets. If your children’s friends all have pets, your children can greatly benefit from the shared experience of pet ownership. Children learn through relating, so your children should not be the only ones without a pet. Your children are spending too much time with technology. While technology is a great tool for communication and efficiency, today’s children get far too much exposure to computers, tablets, and cell phones. Increased technology use usually results in a sedentary lifestyle. Having a puppy encourages children to put the phone down and get outside to play. Your children are excelling in school. If your children are excelling in school, what better way to reward them than a surprise trip to Petland to buy a puppy! Good grades deserve creative rewards and your children will be thrilled when they visit Petland and interact with the wide selection of puppies. As a parent, you will be happy when you learn that select Petland locations, including Petland Mall of Georgia, offer financing so the puppy your children fall in love with won’t break the bank. As a family, when you make the decision to buy a puppy from Petland, you join a community of pet families that are committed to ending pet homelessness. Learn more about Petland’s mission by clicking here. Now, we both know it’s time to take that step and buy a puppy for your girlfriend! She tags you and comments with heart eye emojis on almost every puppy post shared on Petland’s Instagram profile. She can identify any breed of dog within seconds. When you visit friends, she greets their household dog with a juicy kiss. Let’s face it, your beautiful girlfriend is a dog lover and she’s been dropping hints about wanting a puppy. You googled “buy a puppy for my girlfriend,” to get the scoop on how to keep her smiling. Let’s cut to the chase, follow our simple suggestions below, and then check out our puppies right here! Find out her favorite breeds. Shopping for women is hard. Chances are your girlfriend hasn’t told you exactly which puppy breed she wants. At Petland, we meet couples in our stores every day shopping for puppies and we have found that girlfriends aren’t as picky when it comes to puppies as they are when it comes to purses. If you are planning on surprising her, avoid asking her friends or even family. Chances are someone will tip her off and the surprise will be compromised. Trust yourself and your knowledge of your special lady. If you know that she is especially fond of a few specific breeds, swing by your nearest Petland and let our staff help you choose the puppy with a personality that matches your girlfriend’s. 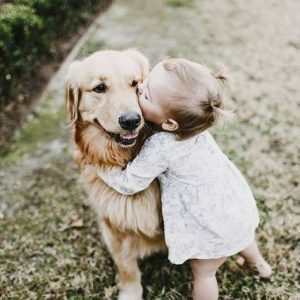 While breed is important, connecting with the puppy will make the experience of pet parenting even more special for your girlfriend. Hobby breeders as defined by the Animal Welfare Act, who raise their dogs in a humane manner. After you have chosen the puppy of your girlfriend’s dreams, you should plan to reveal it to her as a surprise. Youtube has awesome inspirational footage of loving boyfriends surprising their unexpected girlfriends with puppies. Be sure to record your girlfriend’s reaction of her new Petland Puppy. We’d love to watch! If you are thinking of adding a puppy to your family but you live in an apartment, there’s no need to fret! At Petland, we are take pride in providing education for pet parents. There are definitely breeds of puppies that do well in smaller environments! Here are five things you can do to make puppy apartment living easy and comfortable. Check if your apartment has breed or weight restrictions. Some puppy breeds like Rottweilers start out small and soon grow to be larger than life. If your apartment has breed or weight restrictions, make yourself aware before you purchase your puppy. Stop into the leasing office of your complex and inquire about their policies and any fees associated with having a pet. Ending pet homelessness is the goal of every staff member at Petland. 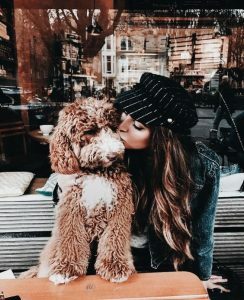 We work closely with apartment dwellers to find the best apartment puppies and the top breeds for the apartment lifestyle. We recommend smaller breeds, because these puppies won’t outgrow your apartment before you do. But you’re not limited to small breeds, there are large breed dogs that do great as apartment puppies, like Great Danes and Mastiffs. Purchase a crate and get educated on crate training. Living with a puppy in an apartment brings a unique set of challenges. Your puppy will depend on you to provide training. Crate training is a great way to help your puppy get adjusted to your apartment. At Petland, we provide in-depth details on crate training to all puppy parents before they head home. We also carry a wide variety of crates. Our staff can assist you with finding the perfect crate for your new apartment puppies. Crate training should be a comfortable experience for you and your puppy, so if you didn’t purchase your puppy from Petland, you can still receive the education you need when you stop by our location. Most puppies need exercise, so you should plan on taking your new puppy to the nearest park, and often! Some apartments have plants and grassy areas, but nothing compares to a spacious park with open turf. If you work standard 9-5 hours, chances are after a long day of working and commuting you’re too tired to visit the local park. Consider taking lunch time breaks or using a dog walking service so that your puppy can get fresh air and exercise while you are at work. Your puppy will tend to get bored and lonely when left alone. Toys are a great way to keep puppies entertained. Having access to toys also prevents puppies from exploring trash cans or chewing on your favorite pair of shoes! Petland carries puppy toys that are durable and affordable, like the popular Kong brands. Feeding your puppy high quality food will ensure your puppy feels good. Just like humans crave fast food, puppies enjoy the flavors of cheap, low quality foods, but these foods can cause health problems later down the line. Every puppy is unique and different and so are their dietary needs. Our staff at Petland can help you choose puppy food that is high quality and meets the needs of your growing puppy. Coming to the decision to buy a pup can mean many different things to people, but here at Petland Mall of Georgia, we welcome anyone who wants to explore the joys of pet ownership! Purchasing a pet is a priceless experience for you and your family. Here are 5 things you should know before you buy a puppy. Puppies provide unconditional love and companionship. They are good for the body and good for the soul. Sometimes we don’t get the exercise we need, but having a puppy is great motivation to get out of the house to go walking. The simple activity of walking helps stimulates our muscles and our minds, while helping the puppy become familiar with their new environment. Puppies are eager to explore, so a good brisk walk is beneficial to both you and your new puppy. Owning a puppy helps balance your lifestyle and gives you the opportunity to exercise and enjoy time outdoors. Puppies are emotionally healthy for your life. Owning a puppy can have a positive emotional impact on your life. Children can learn empathy and the joy of caring for a living being besides themselves. Children then tend to apply this learned empathy and use it in other areas of their lives. These young dog owners learn to have patience and understanding for others. Did you know owning a puppy decreases stress and prevents depression? Owning a pet actually brings stress levels down. Dog owners look forward to caring for and spending time with their furry friends. They’re also less likely to experience depression if a puppy is in their lives. There is a sense of security, because no matter what they are always there for you, therefore you’re less likely to have bad or lonely days. Senior citizens thrive even more when they have a puppy in their lives. It gives them a sense of hope, love, and a positive attitude in life. Meeting new people and having new experiences. 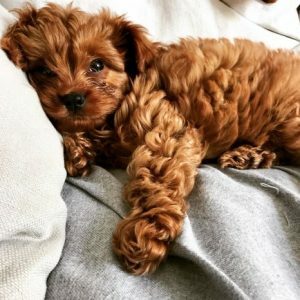 This may not be something you are seeking, but it comes with the territory of owning a puppy. It’s a good thing, since loving dog owners have a lot in common. In just a simple walk with your dog, you will meet others with the same interest of caring for their puppy. Stories can be shared over coffee and puppies can find new friends. If you’re ready to buy a pup that will bring joy to your life, let Petland Mall of Georgia guide you to the right puppy for your family.